The Mersa tribe are based in Habru in the Amhara region. The vast majority of the population in the Amhara region are Christian Orthodox. The musicians at our recording session made reference both to Islam and Christianity. 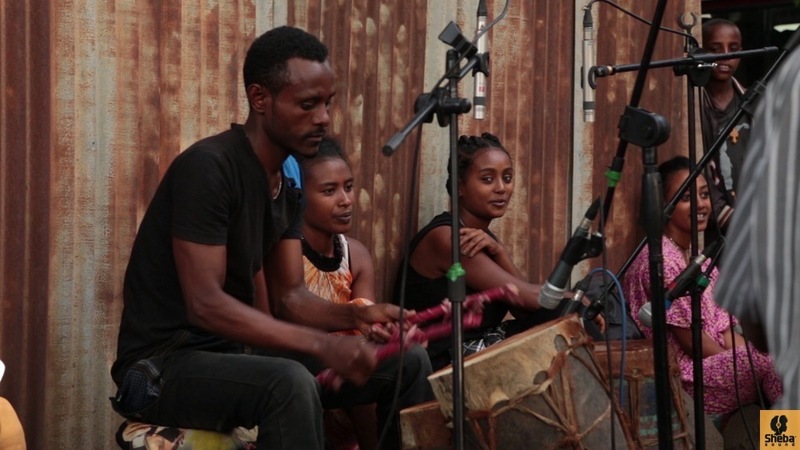 This is reflected in their music, since the beat most certainly has its roots in Amhara tradition and the church, while their melodies and lyrics have a strong Arab influence. The track below, Senderew Na, is a popular traditional song played on weddings and religious occasions. It also used to be played on Arefa (the Muslim holiday of Eid al-Adha); but nowadays, they say, ‘the situation is much stricter’! 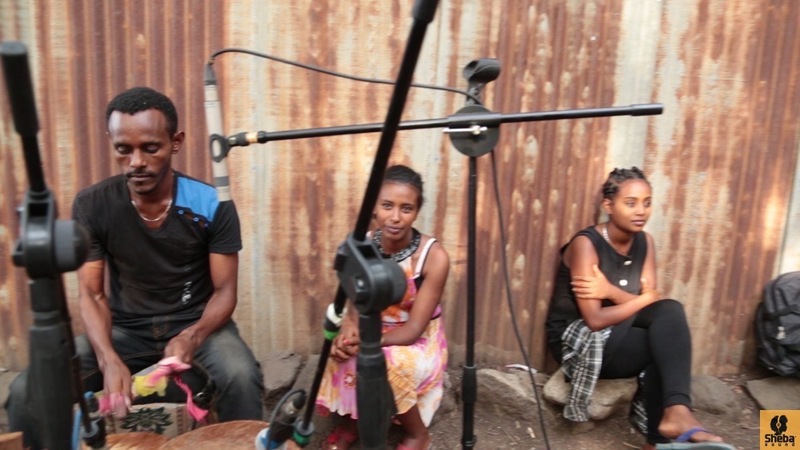 During our recording session (16 May 2014) we conducted an interview with one of the singers, Mulugeta Bezaw. Hello, first, what is your full name, age, and occupation? Okay, my name is Mulugeta Bezaw. I was born here in Habru. I work as a singer in the traditional band that has been created by our wereda because our country has a lot of cultures. This is my occupation. If you could explain to us a little about Habru Wereda? What can you tell us about the culture of Habru Wereda? Habru is a wide area. 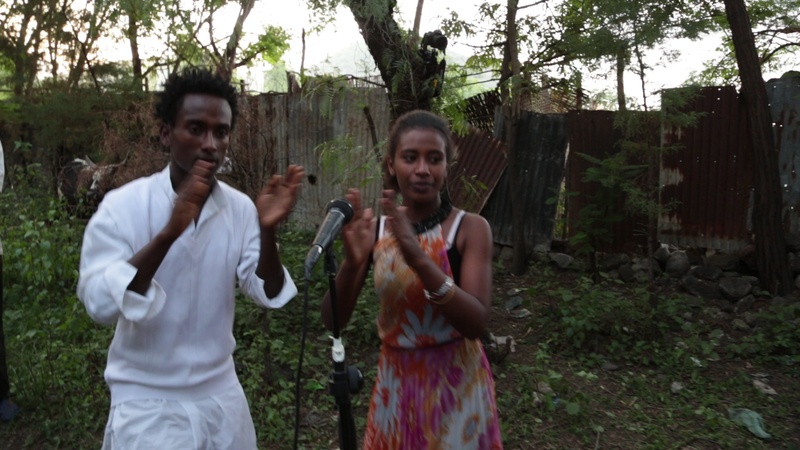 All the songs we performed to you earlier are about Habru, the fruits, the farmers, the people, about its kindness. You have heard everything in the songs. We did not make any of that up (all that didn’t come from anywhere), it is (all) true. There is nothing mixed in or added to it, all is what happens in Habru, what the community says. Habru is a Woreda, and has a lot of small Kebeles within it. There are a lot of different melodies and dances in these Kebeles. We go there and gather these traditions, and bring them out to the towns. We present them to zone, regions, and various stages and we promote Habru any way we can. All the lyrics you heard earlier, we sing a lot about the fruits. We have a lot of fruits here, it is an area where guava, bananas, oranges, and sugarcane are produced. The area is also well known for its kindness, if you have heard the saying “Mersa sons of nobles, descendants of the kind”, this is what they call us. When you interpret this, everyone knows about Mersa. This is because many great people, people known for their kindness, who bring together people and hold together the community when they fight, who have worked a lot to advance the culture, and who are strictly religious, great people who understand and influence the community, have lived and are buried here. This is a place where their burials (tombs) are celebrated. Habru is very big, it isn’t something that can be explained so briefly. There are many things here. 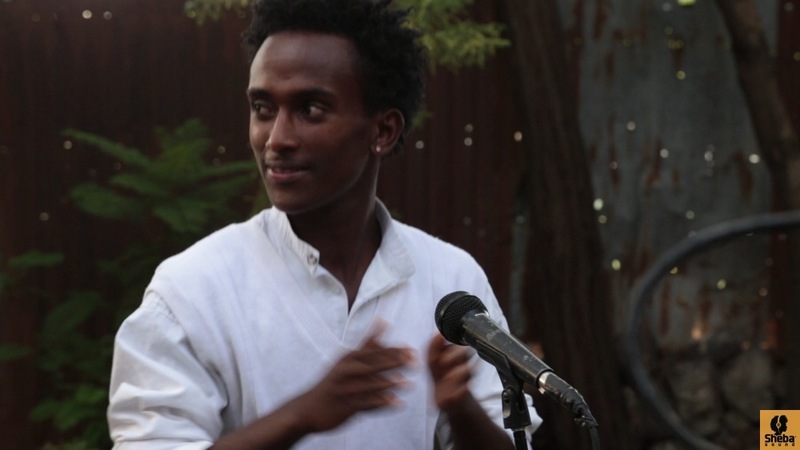 We sing for Habru, we mention a lot of her virtues. You can never talk enough about Habru, as for beauty, if you go into Arerit, which is a small Kebele, there is Muhuro, Sodoma, Chere, all these are small Kebeles in Habru, if you see our women they are very beautiful, and if they were to travel around Ethiopia, all Ethiopian people would applaud (appreciate, praise) them. Even the men are like that. The Gofere (Afro hairstyle) you have seen on our washint player, this is the place you can find pure (unadulterated) culture. Of course there are other places you can find this. But what we have been playing and showing here, plus what we play in other places, is the culture that has come out of our community. This is what you will find if you go deeper into the country. We are following them in what we play, and people love it. So briefly, this is Habru. So you have said this much about Habru, now if you can tell me a bit about the musical tradition in this area. Where do you think it comes from? What times does the community come together and play? Tell me something about the musical and dancing tradition in Habru. We have a very broad musical tradition, and it has its own times and seasons. For example, there are songs that are sung during harvest. We have something called Jiggi in our culture. When a farmer is about to harvest his field, he calls on the others to come and help him, and they all leave their own work to come and aid him in his harvest. This tradition is called Jiggi. At that time they bring jugs of tella (local beer), there is food, and songs of Kererto and Fukera are played while working. There are a lot of songs we have not played today because you don’t have time. Songs that are played at these times. So there are songs that are played during harvest such as kererto, fukera, and songs they make up mocking each other. This is one of them. The second one is the one called Hota, which we played earlier saying “Yahho”. This is played for weddings, when people are coming back from Jiggi, or coming back from the fields from whichever work they are doing. People do not come back from the fields alone. They come back as a group, as they left in the morning, singing and dancing in high spirits, just like they do their work. We have this kind of tradition. There are also other musical traditions that we are now turning into songs. When someone falls ill, we have a tradition called Gurri, which can be found at any place, and is a prayer (entreaty) for the ill person. This music is contained inside and does not reach the media. So we have taken the music and the dances from this and presented it to the media, at Woreda and zone level, and have even been given a trophy for it. 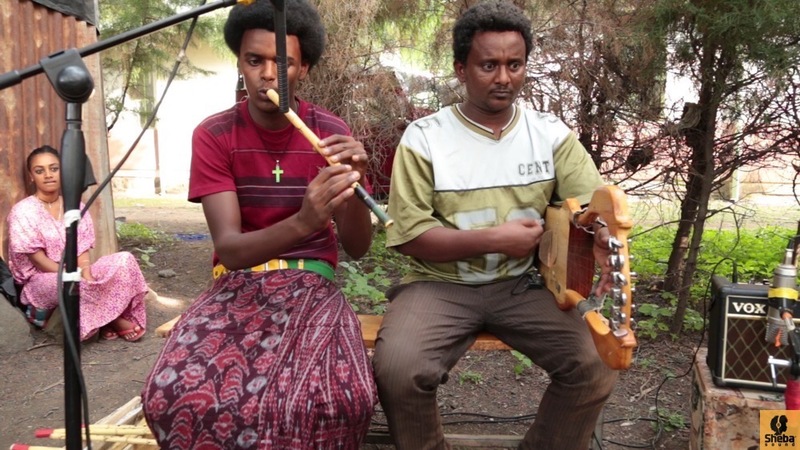 So Habru has a lot of hidden musical traditions that are played on different occasions. We also have others. There is the wedding shilela. There are also songs played for holidays and for Timket. Not only to celebrate Timket, but since it is a culture and mustn’t pass. We have a lot of traditions. I have only told you a few of them. Historically speaking, where do you think the music, i.e. the rhythms, melodies, and particular style of singing come from? What kind of lifestyles or situations do you think they evolved from? We understand, from what we have heard from our fathers that at first small settlements and communities arise. Then these communities grow into a Kebele and again into a Woreda. All these communities that settle come with their own particular history and traditions. For example, Buhoro, Meneyu, and Arerit are part of our area. And if I take you there, the songs we were singing earlier that went “Ahaa” are wedding songs, if you take any modern cassette recordings or wedding songs that are mixed with other cultures then they won’t understand it. Their music is also a way of communication for them, like language. This is what our fathers told us. However, we have proven that what they have is their own and not taken from others because if you go somewhere else, you also find that they have their own sounds. But they do not have ours. That in itself shows that it has come down to us through our fathers. And that is how we see it. If you go to the Culture and Tourism Office you will find out about the great people I told you about, how kind the people are, our culture, and every single thing is kept there. We are learning from that angle, and as youth we are very receptive, so we work quickly in practice so that the culture won’t be lost, going deep into the countryside and finding the information. We are working to preserve the whole culture, including the materials (instruments?). How do the children and young people in this area view the traditional music? If you could explain further on what you started earlier? How is the growth? Is it growing or being left behind? Your opinion. My opinion is that the community, especially in what is called Habru Woreda, loves the music because it is their own and what they grew up listening to. The community has even collected money so the music can be recorded on CDs and five people have already got their CDs out. Even now the community is giving its support to get this music out and telling us that it is right behind us. Both young and old get up to dance when they hear the traditional music after listening to other music. This is when they get a special feeling. So they love it very much, the community loves it very much. So you think it is growing? Yes, if it continues like this it will grow very much. We don’t mix or adulterate it, but I believe that if we put out what we have there are many traditions that can still be displayed. If there is anything you would like to add? I would like to say that it is when we begin from our own music, and dig deep into the countryside to bring out and promote the culture, we promote as a Woreda, the zone also promotes it, and this is how the great culture in Ethiopia can, as a country, improve and become well-known in the world. We have to begin from our own culture. However nowadays, in some places, you see that we exaggerate the culture from abroad. We should leave that and bring out the hidden traditions from the roots, we might be better than them, and for sure they will like us, it will be loved. It is already out now, we have seen great work being recognized in Ethiopia as well as abroad. Ethiopia has many attractive cultures (traditions). I think that we can present great cultures for Ethiopia by starting from the tiny hidden cultures without looking down on them and respect our culture. For occasional news about our recordings, releases and events, please join our mailing list.